Recurrence plot analysis is a well-established method to analyse time series in numerous areas of research. However, it has exponential computational and spatial complexity. As the main result of this paper, a technique for the computation of recurrence quantitative analysis (RQA) is outlined. 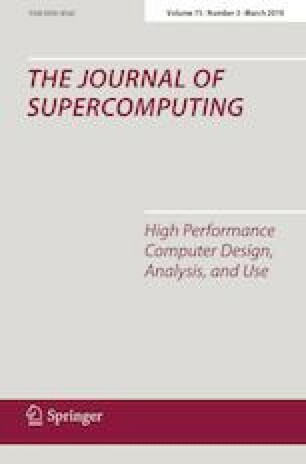 This method significantly reduces spatial complexity of computation by computing RQA directly from the time series, optimizing memory accesses and reducing computational time. Additionally, parallel implementation of this technique is tested on the Salomon cluster and is proved to be extremely fast and scalable. This means that recurrence quantitative analysis may be applied to longer time series or in applications with the need of real-time analysis. This work was supported by The Ministry of Education, Youth and Sports from the National Programme of Sustainability (NPU II) project “IT4Innovations excellence in science - LQ1602” and by the IT4Innovations infrastructure which is supported from the Large Infrastructures for Research, Experimental Development and Innovations project “IT4Innovations National Supercomputing Center LM2015070”. This work was partially supported by grant of SGS No. SP2017/182 “Solving graph problems on spatio-temporal graphs with uncertainty using HPC”, VŠB - Technical University of Ostrava, Czech Republic.